Professional Poker writer and player David Sklansky introduced the gap concept to poker in his book Tournament Poker for Advanced Players . What is the gap concept? The gap concept simply suggests that it takes a better hand to call a raise than it takes to make the first raise. The "gap" describes how big the distance is between the value of the raiser’s hand and the value of the potential caller’s hand. This "gap" increases when playing against a tight opponent and decreases when playing against a loose opponent. For what it's worth, the gap concept is not exclusive to Texas Hold'em. It can be played to almost all variants of poker where there is an initial round of betting, including variants like Omaha and 7 Card Stud Poker. The green and purple lines are the most important ones to think about. 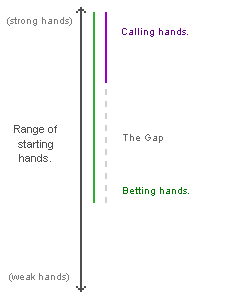 This is a simple diagram to highlight the gap between hands that players are prepared to bet with and hands that players are prepared to call with. The green and purple lines increase in length for loose players with wide starting hand ranges. The green and purple lines decrease in length for tight players with strict starting hand ranges. The gap increases when looser players bet in to tight players. The gap decreases when tighter players bet in to loose players. Don't forget that this is just a very basic diagram to illustrate the gap concept. It does not factor in other important stuff like; the number of players at the table, player position, bet sizes and metagame conditions. An example of where the gap concept can be used is when you are holding a hand like AT in middle/late position. If there has been a raise before you, it is likely that your opponent will have a stronger hand because they have raised in an early position. A raise from early position usually shows more strength than a raise from late position, because the EP raiser knows that a number of players will be acting after them and they will be one of the first to act on following rounds if another player calls. Therefore we can put our opponent on a range of good hands like AK, AQ, AJ, AA, KK, QQ, JJ and so on. Most of these hands that an early position player would usually raise with have our hand dominated; therefore we should fold the hand. A raise from early position shows far more strength than a raise from a player in late position. However, if there has been no raise before the action gets to us, it may be a good idea to raise because we may now have the best hand. In addition, we would be using the gap concept to our advantage because any players acting after us will be concerned that we have a strong hand if we raise (like the hands outlined above), and they will have to have a good strong hand to call. Furthermore, by raising in late position we have the opportunity to take down the pot because there are less people to act behind us. How the gap concept works. The gap concept relies on players giving the initial raiser a range of starting hands that they believe they would raise with. The tighter the table image of the raiser, the smaller the range of hands would be and therefore there would be a greater "gap" between the value of the raiser’s hand and the value of the hand that the player is contemplating to call with. 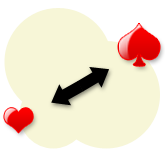 Subsequently, the range increases and the gap decreases if the raising player is loose, as a loose player may well be raising with much weaker holecards. This means that stronger hands will be needed to call a tight player’s raise than a raise from a loose player. This may seem a little confusing at first, but it simply incorporates the basic idea that you need a very good hand to call raises against tight players and that you do not always need a strong hand to call a raise from a loose player. When you call a raise, it is indicating to your opponent and the rest of the table that you have a strong hand. However, when a player raises, it does not necessarily mean that they have a strong hand, as they could just be playing aggressive poker. Therefore this is where the gap concept is used to show how it takes a stronger hand to call a raise than it does to make the raise in the first place. The gap concept is used to help show you the advantages of aggressive play and how you must be selective about the hands that you play with in the face of a raise.